We've just published a new video entitled "How to Enter the Asia-Pacific Stevie Awards. Watch it now. The Asia-Pacific Stevie Awards are the first new Stevie Awards program to be launched in seven years. This business awards program is open to all organizations operating in the 22 nations of the Asia-Pacific region. There are 18 categories to choose from, and entries may be submitted, and will be judged, in Chinese, English, Indonesian, Japanese, Korean, Malay and Thai languages. The early-bird deadline, with discounted entry fees, for the 2014 competition is November 6. The final deadline is December 4, and late entries will be accepted through March 31. Finalists will be announced on April 9, and celebrated at an awards event Seoul at the Lotte Hotel on May 30. The new video provides a whirlwind tour of the awards' website and the category-selection and entry-submission processes. The entry process for the Asia-Pacific Stevie Awards is a bit different from that of other Stevie Awards programs, as the website is built on an entirely new platform. So even if you're a long-time entrant in Stevie Awards programs, we recommend that you watch this video. Versions of the video in a number of other languages will be available soon. 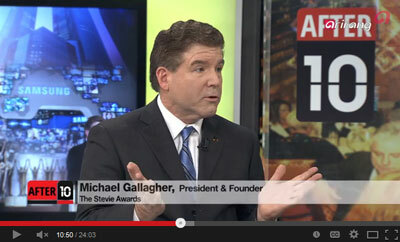 Learn more about the Asia-Pacific Stevie Awards at http://Asia.StevieAwards.com. Tokyo, Japan, 3 June, 2013: BOSS Magazine of Japan announced today that it will be the official media sponsor of the Stevie® Awards in Japan. Founded in 1988, BOSS Magazine focuses on corporate activities, behavior and culture through research and interviews with entrepreneurs, politicians and management executives. With a monthly circulation of 37,000 readers, this business journal is committed to their editorial policy, "management is people." The Stevie Awards organize the world’s leading business awards programmes, including The International Business Awards, the Stevie Awards for Sales & Customer Service, and the forthcoming Asia-Pacific Stevie Awards. The magazine will be the media sponsor for all international Stevie Awards programs, but will primarily focus on the Stevie Awards' newest program, the Asia-Pacific Stevie Awards. The latest Stevie Awards program will be open exclusively to organizations operating in the 22 nations that comprise the Asia-Pacific region. Entries will be accepted beginning 1 July with an entry deadline of 15 September. Organizations and executives operating in the Asia-Pacific region are invited to submit entries to a number of categories ranging from Manufacturing Company of the Year and Services Company of the Year to New Consumer Product of the Year and Technology Executive of the Year. Complete details on the competition are available at http://blog.stevieawards.com/asia-pacific-stevie-awards-mailing-list. "We are very excited to be working with the Stevie Awards and share business award opportunities," said Norio Seki, BOSS Publisher. "Together, our partnership will recognize the best companies and executives in Japan." BOSS Magazine, founded in 1988, delivers monthly content on corporate culture to 37,000 readers. With an editorial policy of "management is people," the business journal strives to promote corporate activity through research and interviews with industry leaders. In the past 25 years, BOSS magazine has interviewed more than 3,000 management executives, politicians, and entrepreneurs. To learn more about BOSS Magazine, visit http://keieijuku.net/index.html.